Offering power, sophistication, and real competition for traditional trucks, the new Toyota pickups are a sure thing for new truck owners of West Palm Beach. 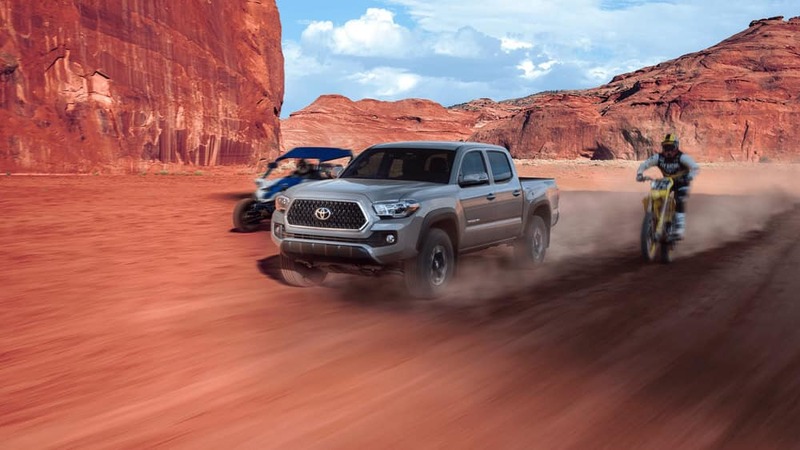 The 2018 Toyota Tacoma and 2018 Toyota Tundra both offer the performance, utility, and additional features you’re looking for, while also living up to Toyota’s long-term reliability reputation. Within this year’s Toyota Tacoma model, you’ll get power from a V6 engine with a 6-speed automatic transmission and an upgraded suite of safety features. Toyota Safety Sense™ P (TSS-P) now includes forward collision warnings with automatic braking and automatic high beams for the clearest vision on night drives. The 2018 Toyota Tacoma is now sportier! With its strong exterior build and luxurious interior features, such as the spacious platinum seating and integrated safety technology, the Tacoma delivers the comfortable first-class treatment anywhere you go. The Tundra has an available 5.7L V8 engine that puts out a robust 381 hp and 401 lb-ft of torque, and new off-roading capabilities have been added, so your next adventure can take you anywhere, even off the beaten path. When looking for the most out of your Toyota pickup, check out the Toyota Tacoma or the Toyota Tundra to see which best fits you and your driving needs. Schedule a test drive to experience the power of the pickups at Earl Stewart Toyota of North Palm Beach. There are myriad benefits to buying your new pickup with us, like no dealer fees and getting a new truck that’s within your budget!